EDMONTON, Alberta (AP) — Now that Alex Morgan has had a start, look to see more of her at the Women’s World Cup. Morgan is one of the most visible players on the U.S. national team, with endorsement deals with Nike, ChapStick and Nationwide Insurance. But Morgan came in as a sub in the U.S. team’s first two matches in Canada while she returned from a bone bruise in the left knee. She made her first World Cup start in the final group stage match, a 1-0 victory over Nigeria. Now that Morgan appears to be back and healthy, she’ll be a player to watch for the second-ranked United States team, which plays No. 28 Colombia to open the knockout stage Monday in Edmonton. The speedy 25-year-old, appearing in her second World Cup, has 51 goals in 84 international appearances. MARTA, BRAZIL: A forward, Marta Vieira da Silva is arguably one of the best women to play the game. She scored on a penalty kick against South Korea in the group stage, becoming the all-time leading scorer in the Women’s World Cup with 15 goals. This is Marta’s fourth World Cup. The 29-year-old was named FIFA player of the year an unprecedented five straight years from 2006-10. Brazil, ranked seventh in the world, won all three of its group-stage matches and advances to face No. 10 Australia on Sunday in Moncton, in far eastern Canada. CHRISTINE SINCLAIR, CANADA: The captain of the Canadian team, Sinclair is the national team’s all-time leading scorer with 154 goals, and ranks third all-time internationally behind Americans Abby Wambach (183) and Mia Hamm (158). Sinclair is well-known in the United States, too: She played on two NCAA championship teams for the University of Portland, and she currently plays for the Portland Thorns of the National Women’s Soccer League. She had a big moment in Canada’s opener at the World Cup with a stoppage-time penalty kick against China. Canada, ranked eighth in the world, finished atop its group and will face No. 19 Switzerland on Sunday at BC Place in Vancouver. HOMARE SAWA, JAPAN: The 36-year-old midfielder is probably best known for her goal in the 2011 World Cup final against the United States. The stunning goal in the 117th minute sent the match to penalty kicks, and Japan came away with the victory. Sawa was named the 2011 FIFA player of the year, ending Marta’s five-year reign. Sawa is playing in a record sixth World Cup. She has 202 international appearances and 83 goals. Japan, ranked fourth, won all of its group-stage matches and will play the Netherlands, ranked 12, in the round of 16 on Tuesday in Vancouver. EUGENIE LE SOMMER, France: A versatile 26-year-old striker, Le Sommer already has three goals at the World Cup. But it was her first, a 25-yard soaring strike into the right corner of the goal that gave third-ranked French a 1-0 victory over England in the group-stage opener. It was her 45th international goal for France. She now has 47 in 108 international appearances, as No. 3 France makes its third World Cup appearance. France stumbled in the group stage with a surprising 2-0 loss to Colombia, but advanced to the elimination round and will play South Korea in the round of 16 in Montreal on Sunday. ABBY WAMBACH, United States: While the debate rages whether Wambach should be a starter or a closer off the bench, there’s no question she creates chances for the Americans. 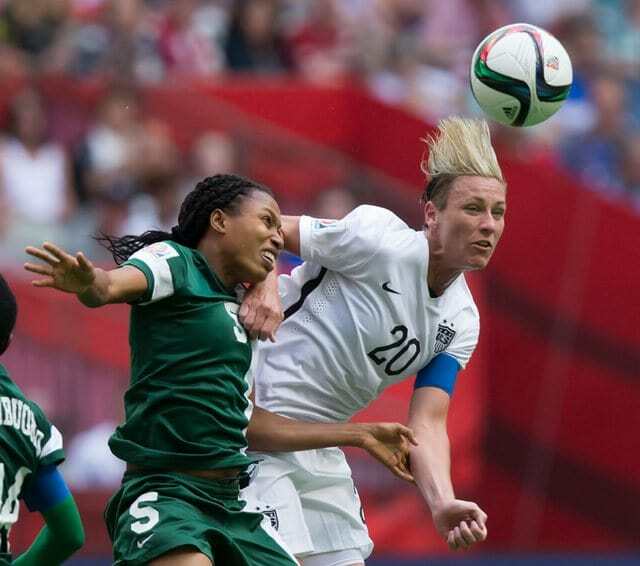 Wambach, 35, is playing in her fourth World Cup. Her goal against Nigeria was her 14th in the World Cup, pulling her even for second all-time with Germany’s Birgit Prinz. Wambach is the world’s all-time leading scorer with 183 goals in 245 international appearances. She was the FIFA player of the year in 2012. She has both started and came in off the bench in the group stage at this World Cup. NADINE ANGERER, Germany: The goalkeeper says she’ll retire from the game later this year, but first wants to lead her country to its third World Cup championship. Angerer was named the team’s starting goalkeeper for the 2007 World Cup in China, taking over when Silke Rottenberg was injured. She did not concede a single goal during the tournament, setting a World Cup record for most minutes played (540) without being scored upon. In the final against Brazil, she stopped a penalty kick from Marta for a 2-0 German victory. It was Germany’s second World Cup title. In 2013, Angerer became the first goalkeeper to win FIFA player of the year honors. Angerer is captain of top-ranked Germany, who will play fifth-ranked Sweden in the knockout round Saturday in Ottawa.